Seagreens® ingredients are suitable for a range of uses in cooking, in the preparation of raw foods and as decorative and highly nutritioous ingredients. Ready-milled grains of wild seaweed can be used as a condiment, salt replacement or flavouring, whilst finer forms can be used in teas, tonics, juices and smoothies! Consumer packs of our ingredients are available, for example as a 90g glass shaker of The Mineral Salt, or in a 200g jar called Culinary Ingredient a Seagreens® classic. Air dried pieces of Seagreens® wild pelvetia up to 10mm deliver a subtle but highly niutritious taste of the wild and are available in a 50g jar of Salad & Condiment. Catering packs of all these products are available from Seagreens Trade Direct - please click here. Research carried out 2007-8 at the UK government sponsored Food Innovation project at Sheffield Hallam University concluded that Seagreens® provides a healthy way to reduce salt (sodium chloride). It contains all the mineral salts in a natural balance already similar to that in the human body. Elsewhere, in Japan, research suggests that a significant mix of Seagreens® with salt may counter its negative health effects. Mixing Seagreens® with other herbs, spices and condiments can produce some sophisticated tastes and interestring uses. 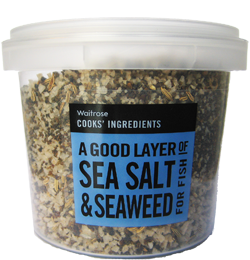 In 2008 Waitrose introduced a new member of their Cook’s Ingredient range containing Seagreens® Medium Granules with fennel seeds and other ingredients as a delicious seafood rub! "Here was this outstanding place (Noma, Copenhagen) doing proper cheffing with ingredients such as seaweed and wild watercress"
- 2009 Master Chef Mat Follas, Le Gavroche and The Wild Garlic, Beaminster, Dorset.